Following a comprehensive on-site evaluation, Reber Ranch’s veterinary clinic receives a formal stamp of approval from the American Animal Hospital Association (AAHA). Receiving this accreditation confirms that Reber Ranch has always been dedicated to offering the best care to their patients and clients. Unlike human hospitals, not all animal hospitals are required to be accredited. Only 15% of veterinary clinics and hospitals are accredited across the United States and Canada, yet the majority of pet owners think their pet’s veterinary hospital is accredited. Reber Ranch recently received their American Animal Hospital Association (AAHA) accreditation on June 15, 2016. To obtain the accreditation, Reber Ranch had to go through a rigorous evaluation that addressed more than 900 standards that cover patient care and pain management, surgery, pharmacy, laboratory, exam facilities, medical records, cleanliness, emergency services, dental care, diagnostic imaging, anesthesiology, and more. 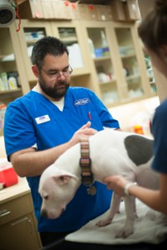 The American Animal Hospital Association (AAHA) is the only organization to accredit companion veterinary hospitals and is consistently at the forefront of advanced veterinary medicine. To maintain accredited status, veterinary clinics and hospitals undergo comprehensive on-site evaluations every three years. Established in 1984, Reber Ranch is a family-owned, full-service pet destination for your dog, cat, horse and even backyard birds. Reber Ranch is home to more than 14,000 square feet of animal supply products, a grooming salon, a do-it-yourself dog wash, a veterinary hospital, and free outdoor dog parks, all of which are open seven days a week.